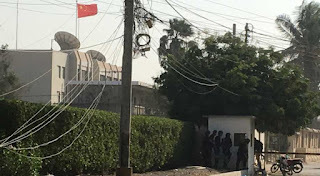 Pakistani police on Friday said they have arrested five suspects from a separatist Baloch group for the November attack on the Chinese consulate in Karachi that killed four people, which they claimed was carried out to "sabotage" the China-Pakistan Economic Corridor (CPEC). At a press conference, Karachi police chief Amir Sheikh said the men arrested confessed to their role in facilitating the three attackers, who were also killed during the November 23 attack on the consulate. He said the detainees were linked to the Baloch Liberation Army, a Balochistan-based group which had claimed responsibility for the attack at the time. Shaikh claimed that the attack was planned in Afghanistan and executed with the help of India's Research and Analysis Wing (RAW) spy agency. There was no immediate reaction from the Ministry of External Affairs to the Pakistani claim. India has opposed the CPEC as it passes through Pakistan-occupied Kashmir (PoK). "There can be no justification whatsoever for any act of terrorism. The perpetrators of this heinous attack should be brought to justice expeditiously," the Ministry of External Affairs had said in a statement last November.